14K Solid White Gold 5mm Diamond Cut Rope Chain (just under 1/4"). Available in 20, 22, and 24 inches. Not sure about your size? Most of our customers order this rope chain in 22" or 24". 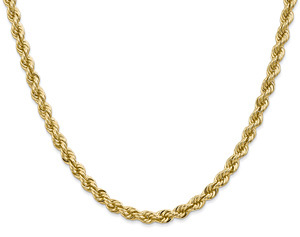 High quality, 14k solid gold rope chain. We guarantee our 14K White Gold Rope Chain (5mm) to be high quality, authentic jewelry, as described above.